Malham Cove merits a larger image: please click to enlarge each photograph! My toy monkey, Jacko, (1972-1976) was a Christmas present when I was three, and he was fabulously garish! He ended up on the dustbin cart as a mascot for the binmen when the stuffing started flying out of him. Mind you - after a few heroics at Malham Cove it's little wonder! This Jacko is an identical one I managed to invest in from an old toy shop in Cheshire ... so I brought him back to relive his cousin's early 70's adventures. I'm sure he was impressed! A lovely signpost points the way to the inevitable. That first view, when leaving the Cove road out of Malham village, is one of the finest in Britain. We couldn't afford a tent back then, so Uncle Derek lent my dad a big blue and orange one (the 70s were big on colour) which Dad patched up and pitched here, by Malham Beck - beneath an old ash tree. You could camp where you wanted in the good old days. Nowadays it's 'dangerous' they say, and 'risky' to be off-site, and these meadows are undisturbed. Jacko's smile widened. This is the camping spot today - on the flat ground beside the stream and roughly in the centre of the picture. I also came back here when I was eight, in Silver Jubilee year. Childhood is the best time of your life, and I feel strangely sad coming here now. This is the area: 'idyllic' isn't the word. Malham Cove, 260 feet high, is a sight to numb the senses. As a four year old I was obsessed ... completely; and I'd never seen white rock before. Once upon a time, a massive waterfall roared over the lip in the centre, but it has now found a new way underground, leaving us the gaunt gliff to admire ... and don't we just? The ancient 'Clapper Bridge' over Malham Beck dates back to Anglo-Saxon times and is made from slabs of weathered limestone. This view across the Clapper Bridge - the name meaning 'bridging of the stepping stones' shows how the slabs have been weathered over the centuries. This has also been referred to as The Moon Bridge and does look like a little like the lunar surface! A wider perspective of the Clapper Bridge, taken from the north. All the water in this stream emerges from beneath Malham Cove itself. A view of the surroundings. Malham Cove shows itself magnificently through emerald green ash trees. It is a massive cliff formed on the Mid Craven Fault when rocks to the north rose upwards (forming the main body of the cliff prior to its erosion to a vertical state) while those to the south of the fault line slipped hundreds of feet below. In simple terms, the limestone that lies below the trees in the foreground once lay level with the pavements on the top of the Cove. The great cliff no longer lies on the precise line of the fault itself, as it has retreated about 500 metres to the north due to erosion and action by glaciers. The actual line of the fault is in the fields north of Malham village, close to the camping spot! The cliff is a horse-shoe shape as erosion was stronger in the centre compared to the flanks. Two distinct types of Great Scar Limestone can be seen in the photograph. The main cliff is of - strangely enough - the 'Cove Limestone' with very few bedding planes, marking a period of almost constant sea levels and deposition of shelly remains over 340 million years ago which formed the limestone. At top right, above the famous 'overhang' - can be seen the 'Gordale Limestone' - forming the 'cap' of the Cove and showing more obvious horizontal bedding planes, representing fluctuations of sea levels and deposition. At the base of the Cove Limestone, Malham Beck usually bubbles out from a narrow, flooded cave passage that has been explored by divers until becoming too constricted. Standing beneath the great Cove, the black streaks of mosses and algae, caused by seeping water, are immediately obvious. Note full grown trees on the ledge of the cliff face, dwarfed by the scale of the surroundings. 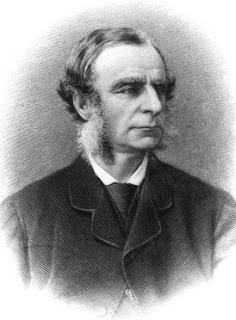 Charles Kingsley (1819-1875) looked at these dark streaks and likened them to the marks made by a chimney sweep who had slid down the cliff face. Comparing this urban idea to the contrasting sylvan surroundings of the limestone country, influenced his writing of The Water Babies. Tom, bullied by the aggresive chimney sweep, Mr Grimes, dies in physical form, but, in spirit, inhabits the beautiful clear streams of 'Vendale' with the nymphs and fairies. Much of the book was penned when Kingsley was staying at Malham Tarn House. The main face of the cove, described by Charles Kingsley as 'an awful cliff filling up the valley with a sheer cross wall.' The 'Gordale Limestone' - so called because it occurs prominently at Gordale Scar to the east - can be seen clearly above the overhang at top right. The 'lip' of the once great waterfall can be seen clearly at top centre. The water no doubt was responsible for carving the central 'arch' of the cove above the tree-lined ledge. It then tumbled over the central buttress before causing further erosion lower down where a prominent wedge has been cut into the limestone. 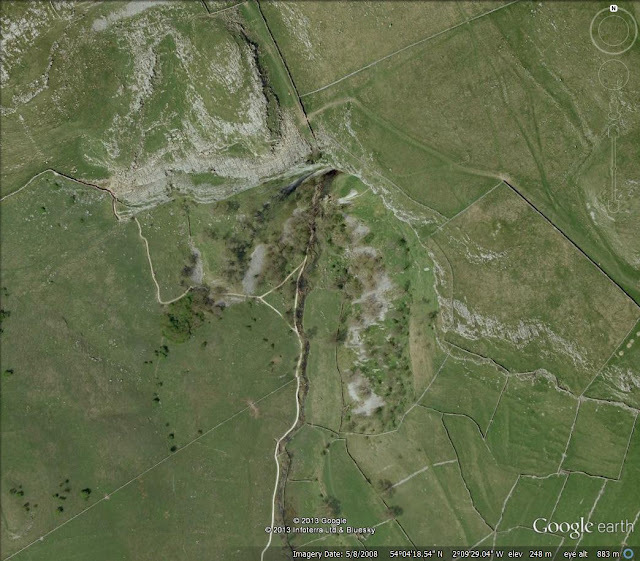 There are many unanswered questions concerning Malham Cove. Why - for example, if Britain's greatest surface waterfall cascaded down a massive cliff for thousands of years - was there not a large 'plunge pool' created by the impact? Did water flow over the edge for a relatively short space of time, then - and was the great cliff more the work of subsidiary glaciers flowing over the top? Another great mystery concerns the 'Dry Valley' above the Cove. It is much narrower than the great expanse of valley below the Cove face, so clearly something other than water must have been at work here: yet if it was - why did it not widen the valley above the Cove instead of leaving it narrow? The most famous landscape feature of the Yorkshire Dales - and yet we are still mystified by it! Great boulders left in the bed of Malham Beck are a further indication that ice flowed over the top of the great cliff. When we came here in 1973 with Jacko - I remember finding a stash of hidden food under the rocks here: everything from 'Ringos' and 'Spangles' to 'Wigwams' and 'Cheddars'. No bananas for Jacko, though .. The greatest mystery of all: the narrow cave entrance at the foot of the Cove, known as Malham Cove Rising. Water vanishing at the Water Sinks at Malham Tarn, a mile to the north, was logically thought to emerge here ... but dye tests have proved otherwise. Most of this water last saw light of day nearly two miles to the north-west on the moor near an old smelt mill. Divers have bravely explored these narrow, water-filled passages but they have become too constricted to allow progress beyond a few hundred metres. Aside of this, little is known about the course of the water and it could well be part of a huge, as yet, undiscovered cave system. The Malham Tarn water, at Water Sinks, actually emerges at Aire Head, to the south of Malham village. Yet, in flood, water from both sources finds its way to both exits!! Malham is not only spectacular on the surface, but has an incredible underground hydrology that positively invites further exploration. Some believe the whole of the area lies over a massive undiscovered network of caverns. In the meantime - we can only take in this magnificent place and feel humbled by it all. Note Kingsley's 'Chimney Sweep' marks right of centre. Peregrine falcons have, in recent years, added even more excitement to the place, rearing their young on the Cove face. When I was here in 1973, there were no raptors, but plenty of house martins. It is one of the very few natural places in the UK chosen by house martins for nest building - but that overhang is better than any troughing. Other inhabitants are the Crag Rats - the Cove offering a range of routes. The first direct ascent straight up the face of Malham Cove took an incredible 58 hours!! This evening I relived my first ever ascent of the cove by ignoring the steps up the west side, and taking a much less frequented and more difficult route up the east wing. In some years, access to this east side is prohibited if the peregrines are in the vicinity, but thankfully this year the falcons are on the central area just below the lip. As Jacko and I began the climb, this great view of the Cove Rising and the first ledge opened up down on the left. From then on, each and every step became more and more awe-inspiring. And we were alone, with just the call of the peregrines. Unforgettable. From this height, the 'horse-shoe shape of the Cove becomes obvious - a huge curving slice out of the landscape. The slopes of the Cove are a botanist's delight. The wild strawberry, Fragaria vesca is a typical lime-loving plant of this habitat, its fruit contrasting beautifully with the surrounding colours. As height is gained, the complete panorama of this world famous feature presents itself to the eye - and is beyond description, so let's allow the pictures to write the words. The movements of the Craven Faults began some 340 million years ago, when what is now Malham was on the bed of a shallow, tropical sea. A coral reef built up around this time, separating the shallow waters from the depths beyond, and it can now be seen as the rounded reef knoll of Cawden, seen here to the south of Malham Cove. Cawden is well known for the ancient square shaped, walled enclosures on its west flank, and for its lynchets to the east. Lynchets date back to Anglo-Saxon times and are essentially where the land is terraced in strips to make ploughing, and water retention, easier. In the centre of the photograph, through the gap in the wall, the remains of a settlement can be made out. Malham village, from the eastern flanks of the Cove, lies beyond a gently undulating landscape of glacial drift, with the shales of the Craven Lowlands beyond. As further height is gained, the magnificent curving sweep of Malham Cove is all the more impressive, with the Gordale Limestone above the overhang being well-seen from this position: its lattice work of joints and bedding planes contrasting with the unbroken mass of the Cove Limestone below. Jacko wasn't concerned with geology. He was enjoying the view that his cousin had witnessed - 40 years before. At least the cameras have been there. Just beyond is a real sense of being on the edge of the world - the curve of the amphitheatre being particularly pronounced. Peep over the edge and think of Jacko. He went for it! A hungry young peregrine waiting for mum. Where was that monkey she'd seen earlier? The erosion caused by thousands of visitors has taken its toll - and the white footpath is a necessary, if garish feature. The delicate lynchets at centre, which bisect the path, are best viewed from the heights of the Cove - and are believed to be older than others in the area - dating back to Celtic times. The lynchets are roughly on the line of the Mid Craven Fault, about 500 metres downstream from the Cove face, indicating how far the Cove has been cut back over thousands of years - helped, of course, by glacial action. Though once thought to be a mainly post glacial feature, research in the caves below the Cove indicate that its origins could date back at least 50, 000 years, much older than was formerly thought. Malham Cove has one more wonder: the famous limestone pavement crossing its top, and carved out of the Gordale Limestone. Being near the Craven Fault, the joints and bedding planes are very pronounced - as are the very distinctive clints, with the deep grykes in between. The pavement was originally formed below a cover of shales and soils. Water seeping through this was acidic in nature and widened the already pronounced joints. Finally, ice during the last glaciation swept off the covering land and left the rock bare and exposed. Towards the brink of the Cove and closer to the Craven Fault zone, the limestone is more shattered and weathered, with smaller clints. The band of Gordale Limestone capping the Cove is well seen in this picture, its base running from the green 'triangle' of turf at centre to the right of the picture, and through the line of shrubs protruding from the cliffs. This picture, taken from the west flank - gives a good view of my route up the steep east slope. Subsidence from water percolating through the limestone appears to have caused this depression in the pavement. Malham Cove's pavement is perhaps the best known in the country - and despite the visitors, is still home to a host of rare plants. Never be tempted to uproot them. The famous 'karren grooving' on the clints, caused by water running off into the grykes. Another section of pavement - looking east towards Gordale. A lovely panorama of the Cawden reef knoll, the east slopes flanking the Cove - and the limestone pavement. A stunning landscape. Alternative view, with a more attractively grooved section of pavement. Once we descend the steps on the west side, that dominating presence is with us once again. This is perhaps the best view of the contrasting beds of Great Scar Limestone that make up the Cove. Even at this distance - the walls of the great cliff begin to be reflected in the waters of the beck. One of the islands in the beck. My Dad and his friends pitched a tent on here in the 1950s only to wake at 3 a.m. with water lapping in their sleeping bags and their food swept away! My Dad, his friend, Colin and little me all went down to the mill pool beneath Pan Holes for a supposed wash - but two ladies had the same idea. It was 7 a.m and I don't think they expected us. There was an unearthly scream (I can still hear it) and my first fully naked experience of the female species tumbled, horrified, out of the water ... but that's another story. Jacko was still asleep, by all accounts! Aerial view of Malham Cove. A settlement can be made out just above bottom right. The grassy terrace of the east flank that I used for my ascent is clear. Descent was by the path to the left, below the pavements. 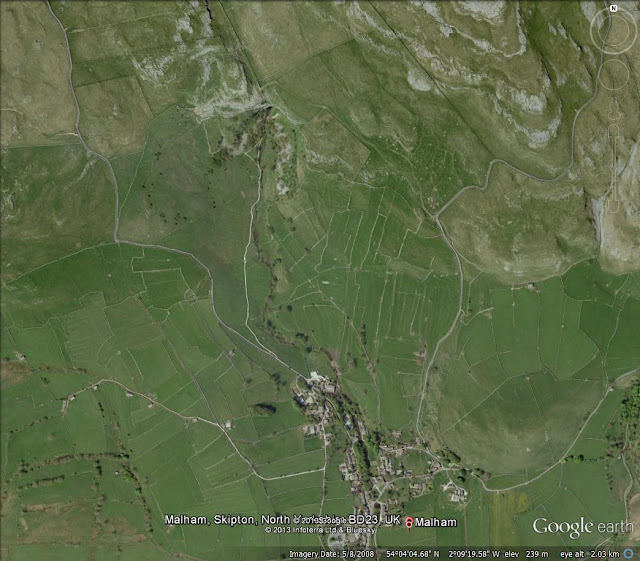 The line of the Mid Craven Fault is roughly at the bottom of the photograph. Wider perspective of Malham and Malham Cove. There is a large National Park car park in the village. Cawden with its lynchets and enclosures, is at bottom right. The easiest, and by far the safest way to ascend the Cove, is to climb the steps up the west flank. The east flank is not recommended unless you are fit, don't mind heights, and have a good sense of balance. You don't want to be playing roly-polies! The quickest way down off the Cove is to do a sky-dive like Jacko, but I wouldn't recommend that, either! It is against the law to disturb peregrine falcons or their nesting site. Pay full attention to the RSPB signs. Thank-you. If this is your first visit to Malham Cove .... well, I envy you!